Our sustained research investment is helping to save and improve the lives of patients. This year, the U.S. Food and Drug Administration (FDA) approved 21 treatment options for patients who urgently need them. What’s more, LLS helped advance 19 of these advancements. In 2017, we witnessed an historic victory for cancer patients when two revolutionary CAR (chimeric antigen receptor) T-cell immunotherapies were approved by the FDA, ushering in a new era in the treatment of cancer. This game changing approach involves genetically reprogramming a patient’s own immune cells to find and attack cancer cells. LLS supported the development of both therapies, which mark incredible progress for patients who have otherwise run out of treatment options: tisagenlecleucel (Kymriah®) for children and young adults with acute lymphoblastic leukemia (ALL) and axicabtagene ciloleucel (Yescarta®) for adults with several types of non-Hodgkin lymphoma. In 2018, the FDA granted tisagenlecleucel (Kymriah®) its second approval, bringing a new treatment option to patients with relapsed or refractory diffuse large B-cell lymphoma (DLBCL), a particularly aggressive disease. In fact, only about half of the 27,000 newly diagnosed patients in the U.S. each year will achieve long-lasting disease control. 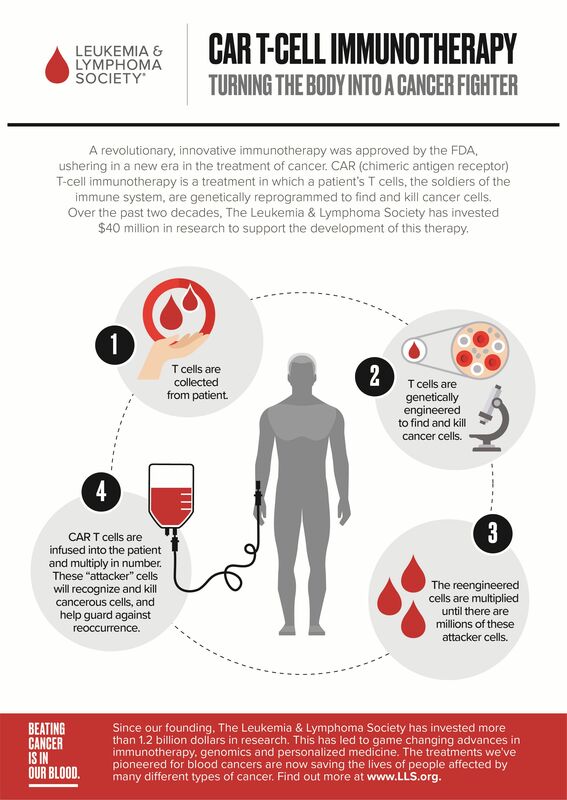 Over the past two decades, LLS has invested more than $40 million in research at multiple institutions to advance CAR T-cell therapy for blood cancer – paving the way for research applications for solid tumors, such as cancers of the lung, breast, colon and prostate. LLS-funded research is making a global impact on the lives of patients: both CAR T-cell therapies are now approved for use in the European Union. We continue to invest in the most innovative science worldwide to make CAR T-cell therapies safer and more effective for more patients and easier to produce. Precision medicine centers on giving the right treatment to the right patient at the right time based on their genetic information and other characteristics. We are beginning to crack the code to apply precision medicine to acute myeloid leukemia (AML), one of the most daunting challenges in the blood cancers. Each year, about 20,000 Americans are diagnosed with AML, and half of these patients are expected to have exceptionally poor outcomes. Standard treatment has typically involved intensive chemotherapy, followed by a stem cell transplant in some cases. But this approach fails most patients, the majority of whom are older adults who cannot tolerate the intensity of treatment. With more than one-quarter of our research budget invested in AML, LLS is leading the charge to address this urgent, unmet need. Our work is paying off. Researchers are now able to home in on specific genetic drivers of the disease – opening the door to a more personalized approach to treatment. ivosidenib (Tibsovo®), a new targeted therapy, was approved for patients with relapsed or refractory AML who have a certain genetic mutation called IDH1. arsenic trioxide (Trisenox®), an existing drug, was approved in combination with chemotherapy for newly diagnosed adult patients with low-risk acute promyelocytic leukemia (APL). glasdegib (Daurismo®), a new therapy, has been approved in combination with chemotherapy for the treatment of newly diagnosed adult patients with AML who are age 75 or older or who have other chronic health conditions or diseases that might preclude the use of intensive chemotherapy. The therapy targets a cell signaling pathway called Hedgehog, which is critical for the development of immature cells into cells with more specialized functions. venetoclax (Venclexta®), an existing therapy, is now approved in combination with chemotherapy, for the treatment of newly diagnosed adult patients with AML who are age 75 or older or who have other chronic health conditions or diseases that might preclude the use of intensive chemotherapy. gilteritinib (Xospata®), a new therapy, was approved for patients with relapsed or refractory AML, who have a genetic mutation called FLT3, which is seen in about one-third of AML patients. Further, our groundbreaking precision medicine Beat AML® Master Clinical Trial is testing ivosidenib and gilteritinib as first-line treatments for newly diagnosed patients. We continue to fund the most promising AML research, and we provide education and support to patients and caregivers. After four decades and millions of dollars invested, we are seeing results for AML patients that give us a real reason for optimism. Dustin was supposed to get married on December 3, 2016, but cancer turned his life upside down. Six days before his wedding, 31-year-old Dustin was diagnosed with acute promyelocytic leukemia (APL). Dustin and his fiancée, KT, stayed at the hospital for 33 days, where he underwent medical tests and began treatment. The couple canceled their wedding, and navigated finances and other aspects of their relationship while Dustin underwent eight months of chemotherapy. When Dustin and KT got married on May 7, 2017, their special day was even more meaningful. “Getting through a little bit of the worse together means appreciating the better even more,” they say. Today, Dustin is cancer free and credits research funded through LLS for saving his life. Because of advances in diagnosis and treatment, APL has been transformed from the most fatal to the most curable form of acute leukemia in adults. Tagraxofusp (Elzonris™) a new treatment, was approved for adults and pediatric patients age two or older with blastic plasmacytoid dendritic cell neoplasm (BPDCN), an aggressive, deadly disease that lacked a standard of care. LLS sponsored clinical trials for this novel targeted therapy through our Therapy Acceleration Program (TAP). Nilotinib (Tasigna®), an existing therapy, was approved to treat children with a rare type of chronic myeloid leukemia (CML) in chronic phase. CML is rare in children, accounting for only about 3.1 percent of new cases of leukemia in children and young adults younger than 20 years. Mogamulizumab-kpkc (Poteligeo®), a new therapy, was approved for two rare types of cutaneous T-cell lymphoma: mycosis fungoides (MF) and Sézary syndrome (SS), giving MF patients a new treatment option and marking the first FDA approval of a drug specifically for SS. Moxetumomab pasudotox (Lumoxiti®), a new, first-in-class immunotoxin, was approved for patients with relapsed or refractory hairy cell leukemia (HCL), a rare, incurable, slow-growing disease. While many patients initially respond to previously approved treatment, up to 40 percent relapse, underscoring the need for more innovative therapies.